I went to my favorite place yesterday; Invia. 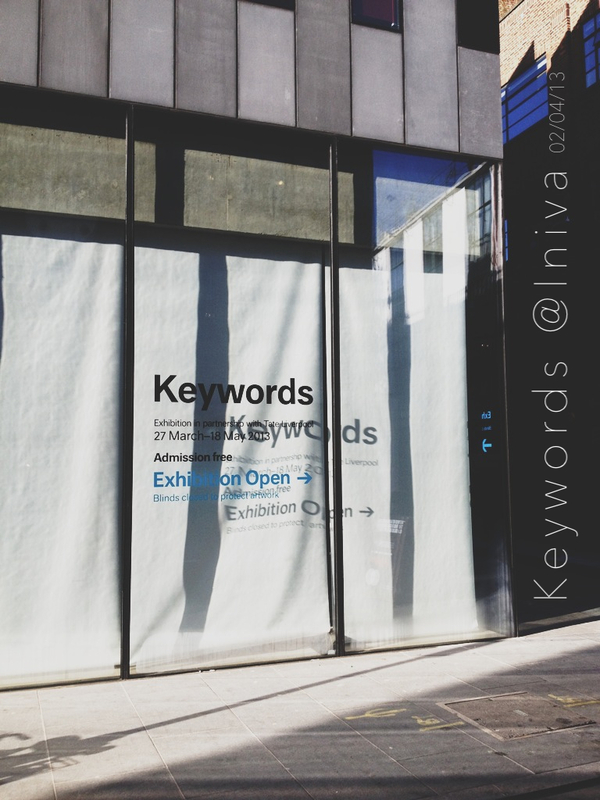 Originally, the book ‘Keywords’ was created by Raymond Williams. Within the book itself he explored the relationship between social, cultural and educational studies. Thus altogether becoming (in a sense) a visual culture. The works are presented from 1976 to present day. It is an extremely visual exhibiton. Though I believe reading the book,or in short the leaflet gives you a completely different insight on the works. I must include, every time I go to Iniva the Curators do an exquiste job. The use of space and time is paramount, Grant Watson most definitely used space symbolically. As you enter, you are immediately greeted by carpet. Yes! Carpet! Which strangely has this nostalgic feel. But later becomes so much more profound, as the primary coloured words literally surround you inticing all senses. One might look at it as a very puzzling,bewildering experience. To be quite honest I did feel on edge with the Sonic Art, mix media photographic work,video installations and Op Art all in one space. Which was a heavy contrast to the video piece on the 2nd floor. I was there for a while figuring out what both Williams and Grant were trying to announce to the public. It became apparent as people came in and left within 5 minutes. The power of words is overbearing and sometimes almost too truthful. It’s going to be end of mine day, but before finish I am reading this great paragraph to increase my know-how. Fantastic, I loved this comment. I hope you had a great day! I was recommended this website by my cousin. I’m not sure whether this post is written by him as nobody else know such detailed about my problem. You’re amazing! That comment has just made my day! Thank you for the lovely words, put my heart and soul in to this site! Thank you for these kind words. I appreciate it! I just want to write, learn and write more. Thank you! Thank you for the kind words. I feel like I should do an extended piece-It seems a lot of readers are interested in this post.